Compton Road fauna overpass in 2015 as seen from the west. In 2015 we met PhD candidate Mel McGregor at a Karawatha Forest Protection Society meeting where she was discussing her work and research on fauna movement. Following that we commissioned Mel to produce a report in order for us to be able to scientifically back up our submission for a fauna movement solution for the Logan Motorway upgrade. A consultative committee was formed by Transurban which included Griffith University, Karawatha Forest Protection Society and B4C. The following report supported the eventual submission formulated by the committee, which recommended a range of different fauna movement solutions consistent with credible research. Scientific justification for overpass constructions at Drewvale (Logan Motorway and Gateway Arterial Motorway). Environmental Futures Research Institute, Griffith University. 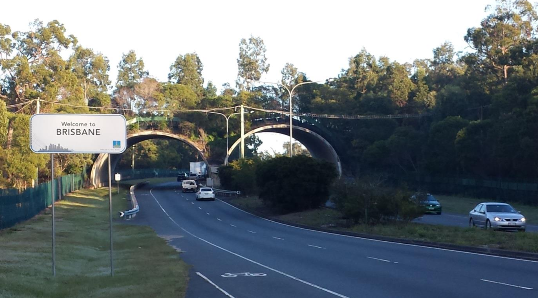 Australia’s newest and widest overpass. Bonville, NSW. The current loss of natural ecosystems within South East Queensland (SEQ) is higher than ever before, making remnant corridors and natural areas irreplaceable ecological assets for the surrounding region. Continual intensive impacts from human activity, particularly associated with roads, facilitate habitat loss and landscape fragmentation which reduces population sizes and increases localised extinction. The Flinders Karawatha Corridor is the largest remaining continuous stretch of forest in SEQ and is a significant feature of the region’s landscape, as recognised by Government planning documentation. Connectivity within the corridor must be maintained if it is to adequately facilitate the movement of wildlife and the subsistence of remnant forest within SEQ. Currently, the presence of large roads within the Flinders Karawatha Corridor severely compromises the primary objective of maintaining the corridor for landscape connectivity. This must be rectified to protect wildlife and ensure the persistence of the flora and fauna communities which inhabit the area. Karawatha Forest and Kuraby Bushlands are recognised as critical components of the Flinders Karawatha Corridor. Connecting Karawatha and Kuraby to the body of the Flinders Karawatha Corridor is a small expanse of remnant bushland around the suburb of Drewvale. Currently, any fauna movements between the reserve and the remnants at Drewvale are severely restricted by the intersecting presence of the Logan and Gateway Motorways. This restriction creates real problems for the safe passage of wildlife that attempts to move between Karawatha and the rest of the Flinders Karawatha Corridor. Overpass placement is identified through fauna and road kill surveys. Integrate Drewvale forested areas into the corridor as functional refuges. Drewvale, fauna movement, fauna overpass, Gateway Motorway, Karawatha Forest, Logan Motorway, Mel McGregor.